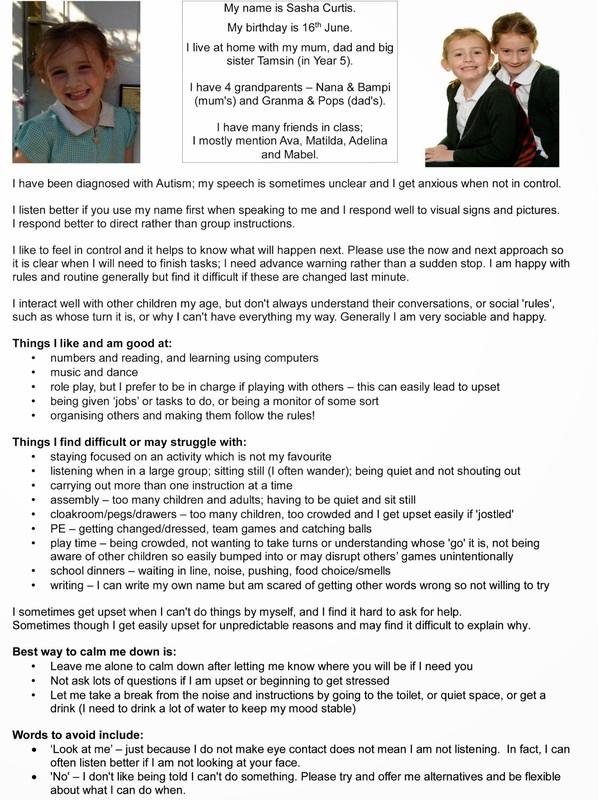 Home ASD autism cook junior school school dinners transition Transition challenges with autism: Junior School next! 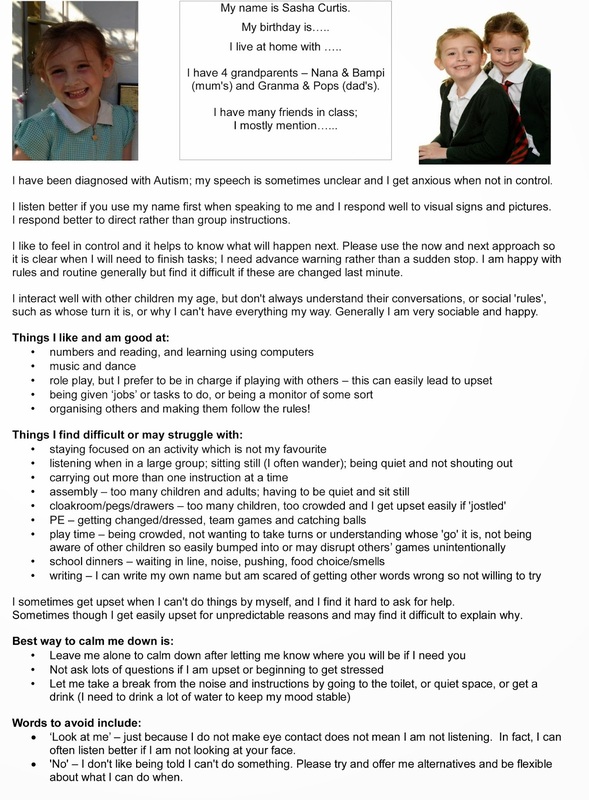 Transition challenges with autism: Junior School next! Preparations for Sasha's transition in September to Year 3 at the Junior School are well under way. The school is linked in spirit to the Infant school, but it is a separate site and the teachers/assistants will be mostly new faces for Sasha. Children with autism often have a much more difficult time adjusting to anything new than typically developing children, so we are aware the change will be a significant challenge for her at first. The increase in 'serious' workload may mean that even more challenges come once she is settled there, but for now we're taking each step as it comes. Meanwhile I continue to search for a Plan B - but more on that another time. We are very pleased and impressed that the school chose to involve us with the transition planning. Sasha has visited the Junior school a few times since half term; there has been some autism training for all staff; I've been for a trip round with Sasha to help get her used to the building, and members of staff visited the Infants school to see how Sasha reacts in the classroom she is currently in. We've given the school a 'passport' for Sasha - this is a one-sided sheet of A4 (see below) with key information about Sasha, such as her likes and dislikes, and anything she may not be able to articulate for herself. These are often suggested for children with Special Needs and can be displayed in staff rooms so that any temporary member of staff can also be forewarned about what does and doesn't work! Lunchtimes are probably one of the most difficult times of the day for Sasha. She eats well enough, but only certain types of food and her diet has become very repetitive. I'm a little bit ashamed to say that 'chip shop' at the weekend has become part of our routine.... Sasha basically has a fear of trying anything new - that stretches across most walks of life for her, not just food. In the school dinner hall there is so much which stresses her - she doesn't cope well with a lot of noise, or strong smells, or queuing, or 'jostling'. It's definitely not the right time or place for her to try new foods, but I was always adamant that Sasha should try the school food as I was never sure she'd eat a packed lunch either. The school cook and her team have been amazing, and they really took Sasha under their wing. Last week Cook waited for me one morning to let me know that she'd made a trip up to the Junior school herself, to have a word with the cook in that school. In fact it wasn't only a word, it was an A4 sheet full of tips of how she has been 'managing' Sasha; the foods Sasha does (potatoes) and doesn't like (pretty much everything else - 'will not eat cake, fruit or yoghurt'), and how it should be cooked (lightly, crispy but not at all burnt etc). There's also an issue around crockery - certain bowls which Sasha won't eat out of, unlike all the other children. We think it's the smell of the plastic, but she's not quite able yet to articulate what the exact problem is, so Cook has tried work-arounds. All of this information she passed on in detail, and I'm sure it will be such a great help for Sasha when the new term starts. So sweet, and so helpful, and I'm so grateful. It is a tiny bit bittersweet, as I know none of the other children need this kind of information sheet or support; however the positives far outweigh that feeling and this act of kindness has definitely made me smile this week.